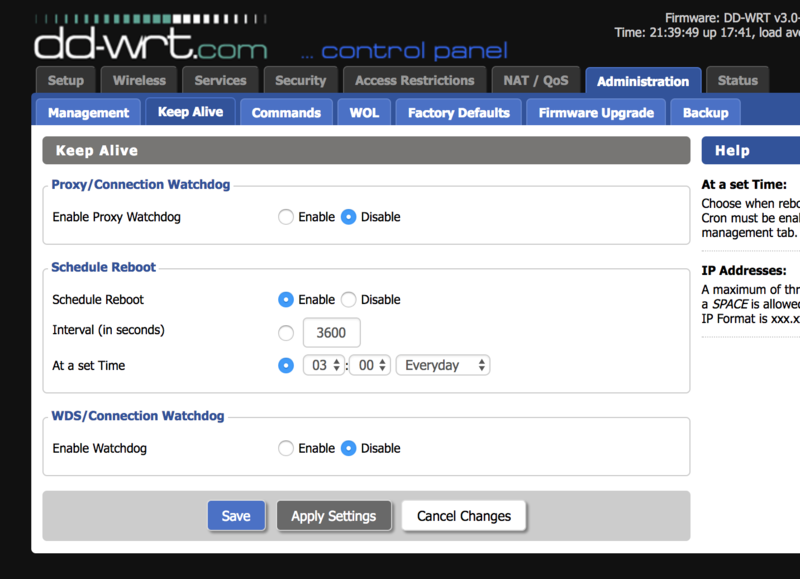 If your DD-WRT router occasionally craps out struggles or stops working properly (usually after being on for a while), try scheduling a reboot. It should help clear the memory and keep everything running smoothly (in my experience). Side note: this post is as much for me as it is you :-) Every time I want to do this I have to search through forums until I find this one, to get the final script I got to that worked. There are two ways to check. Either wait until tomorrow, login and check the uptime (top right corner) to see if it's the right number of hours after your rooter rebooted this morning. Or...set the scheduled reboot to a time that's about 10 minutes in the future from when you set it. 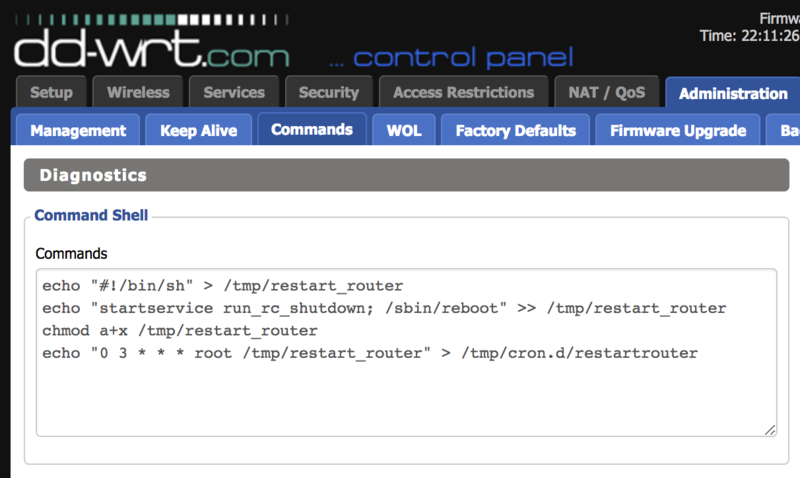 Reboot and watch your WiFi. Very soon it should disconnect while your router reboots so you know it's working (you can check the uptime when it's back). 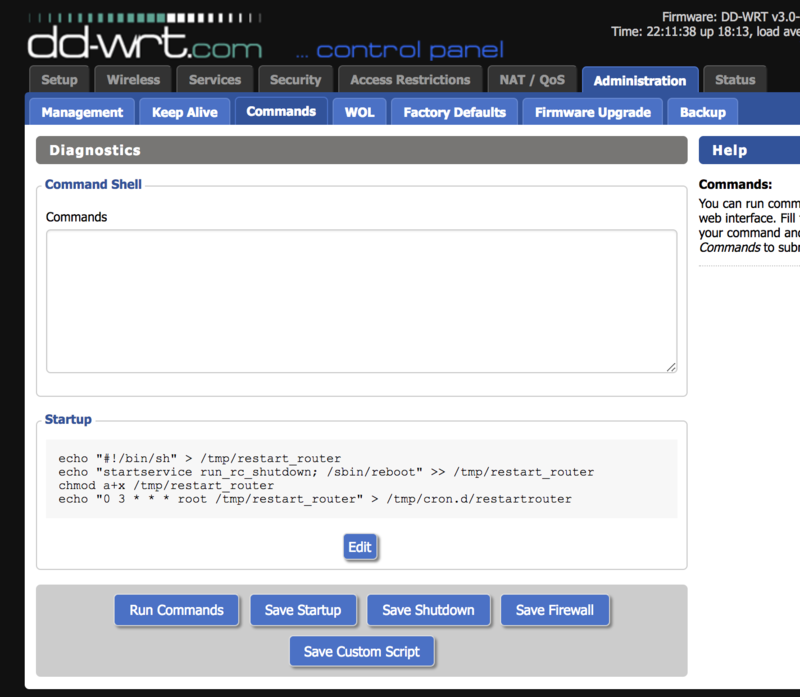 The script will, every time your DD-WRT router boots, create a shell script that reboots your router. It modifies that script's permissions to make it executable. Then it creates a cron job to run that script at 3AM every day. If 3AM every day isn't right for you, adjust the 0 3 * * * portion to suit your needs. You can use crontab.guru to see what you're doing. Same as above, you can either check it works by checking the next day to see if your uptime's right; or you can set it to a shorter time in the future and check then.